28th February 2019 – EASE is pleased to become a signatory to the Leiden Declaration on Transparent Journal Policies. EASE has over 400 members living in more than 50 countries, not only in Europe but also in other parts of the world. The Association offers the opportunity to stay abreast of trends in the rapidly-changing environment of scientific publishing. As an EASE member, you can sharpen your editing, writing and thinking skills, broaden your outlook through encounters with people of different backgrounds and experience, or deepen your understanding of significant issues and specific working tools. Finally, we have fun and enjoy learning from each other while upholding the highest standards. Download our pdf to find out more about what we do to help editors and scientists, or sign up now! Other benefits include subscription to our quarterly journal, European Science Editing (£87 per year for non-members) featuring articles related to science and editing, book and web reviews, regional and country news, and resources, and free access to the online version of the Science Editors’ Handbook, which covers everything from on-screen editing to office management, peer review, and dealing with the media. New Dutch and Slovenian versions added! 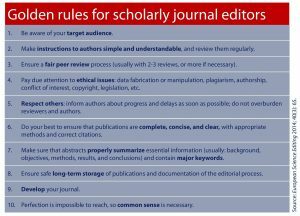 The EASE Guidelines for Authors and Translators of Scientific Articles provide simple, clear advice aimed at making international scientific communication more efficient. The updated edition is freely available in 28 languages: Arabic, Bangla, Bosnian, Bulgarian, Chinese, Croatian, Czech, Dutch, English, Estonian, Finnish, French, German, Hungarian, Indonesian, Italian, Japanese, Korean, Persian, Polish, Portuguese (Brazilian), Romanian, Russian, Serbian, Slovenian, Spanish, Turkish, and Vietnamese.